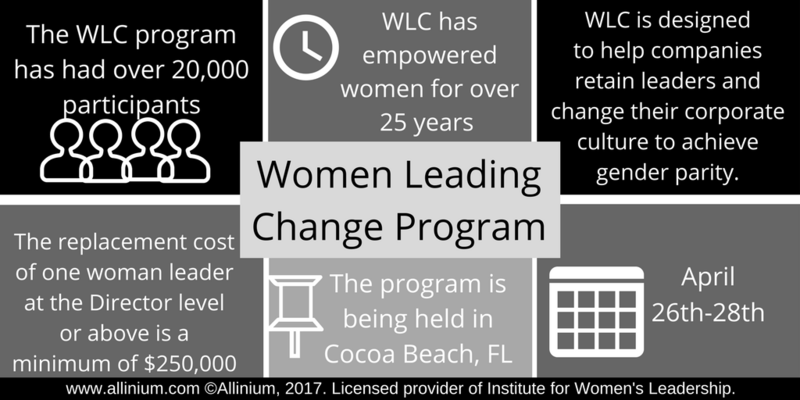 Building on the twenty-five years of experience from the Institute for Women’s Leadership, Allinium is introducing the next open-enrollment Women Leading Change program. Women Leading Change is for women leaders who are ready to make a lasting impact at their organizations and in their lives. No longer are women waiting for men to create change. Especially during Women’s History Month, the positive impact women have in organizations is undeniable. It's not about women versus men, but about women becoming empowered to make change for themselves. Participants become empowered to create an inclusive corporate culture and, in turn, bring full Gender Partnership to their organization. By attending Women Leading Change, participants not only learn how to be the catalysts for change, but also how to maximize their potential as leaders. Participants distinguish what works and doesn’t work about how their lives and careers are structured and discover ways to manage their responsibilities. With reports stating that the cost of replacing a woman at director level or above being at least $250,000, Fortune 500 companies have been reaping the benefits of sending their high-value, high-performing, high-potential women to the Women Leading Change program for over two decades. Women Leading Change is a 2 ½ day program, taking place April 26th-28th, 2017. You can visit https://allinium.com/program/womens-leadership-development#program-details for program details, FAQs, and read what other participants have said about their participation. Please contact info@allinium.com for more information about maximizing leadership talent and bringing full Gender Partnership to your company.